"Diabetic neuropathy is the most common complication associated with diabetes. Therefore, creating awareness among the population about diabetes and its related complications has become very important. Hence, several programs are being initiated by many countries across the world to bring awareness regarding diabetics. For instance, in India, the National Diabetes Educator Program was initiated with the primary aim to educate and train diabetes educators in the country. 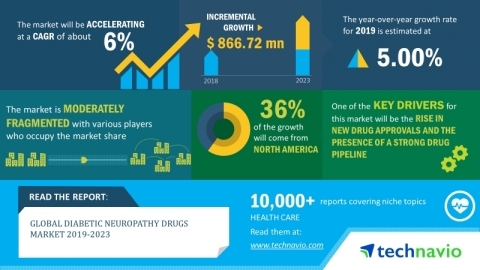 Such initiatives will directly impact the growth of the diabetic neuropathy drugs market during the forecast period," says a senior research analyst at Technavio.